We Give Thanks | Sprezzatura, Y'all! Thanksgiving is my favorite holiday. It’s open to anyone to celebrate – you don’t have to be a certain religion or ethnicity or creed to be thankful. It’s a time for personal reflection on what matters most to you. We should do this everyday, but, sadly, most of us don’t. So, we set aside one day a year to be actively selfless. And there’s food. 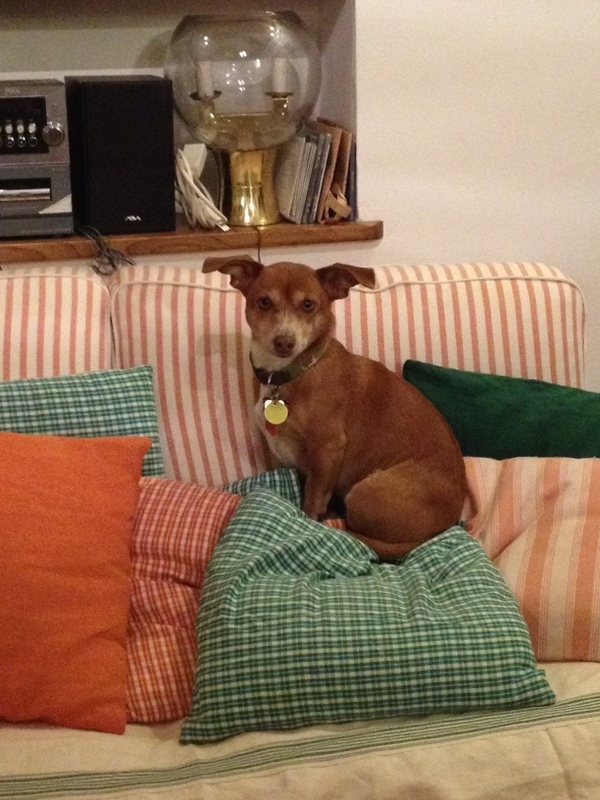 Italians are intrigued by our Thanksgiving. They have so many festas and blessings and celebrations, that this one day we designate as a day of thanks is a little bit of a puzzle to them. And our traditional Thanksgiving food is even more of a puzzle. They eat turkey, but don’t usually roast the whole bird. They pound the breasts into beautiful scallopini and saute them. So this concept of the whole roast turkey interests them. 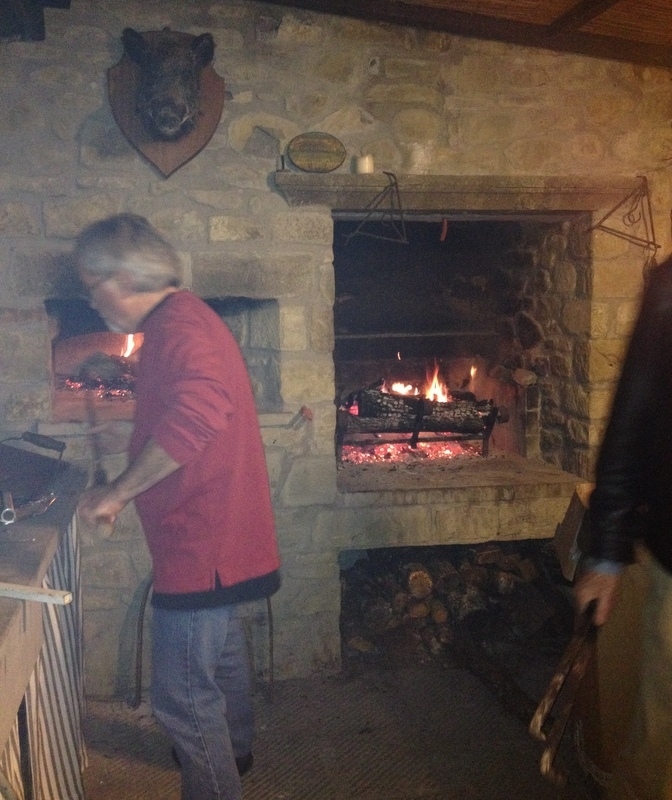 Our landlord and friend, Giovanni, offered us his country house to have our Thanksgiving feast. That’s the house featured on this blog’s banner. It’s a wonderful place just outside Anghiari that dates back to the 8th century when kingdoms fought over land (sounds a little familiar). It was originally a watch tower to make sure no one snuck up on them and took their stuff. Across from it on the other mountain is a similar fortress that was controlled by Charlemagne. This was serious stuff. Today it is a great retreat with spectacular views. And the site of an American style Thanksgiving dinner. Tim and Julie were game to whip up a feast, so the four of us made something close to a traditional Thanksgiving dinner. With no oven. 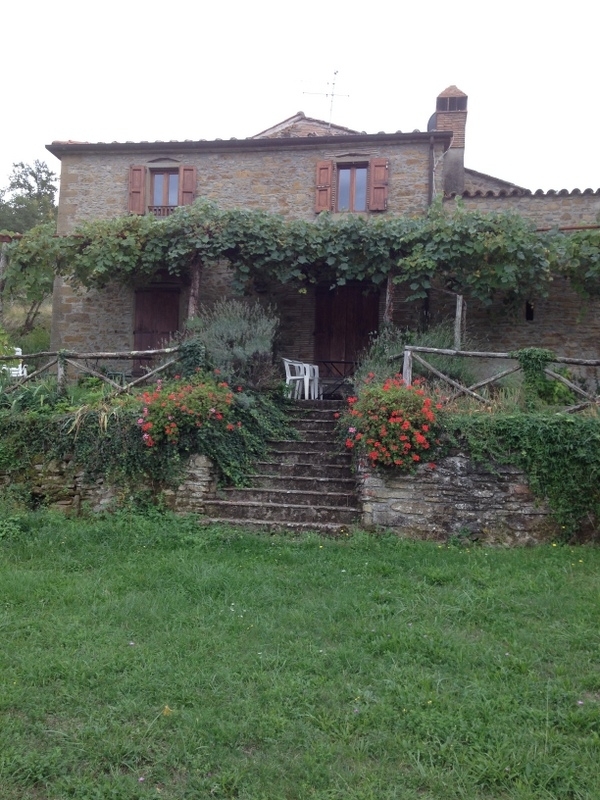 The country house is peaceful and serene and right out of a magazine spread on Tuscan living, but it’s somewhat rustic. Which is, of course, part of its charm. It has a wood burning oven on the terrace and that’s what we used to cook the turkey. 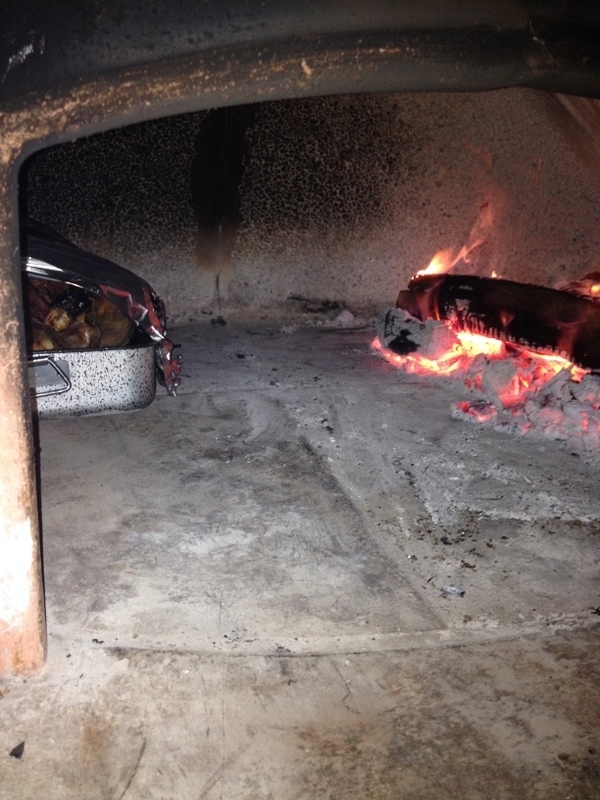 We prepped everything in our city apartment and baked what we needed there and popped it in the wood oven to heat up. We did have a tiny cook top that Julie used to make green beans and mashed potatoes. It was definitely the most interesting Thanksgiving dinner I’ve ever been a part of. It rivals the year that I made lasagna for Thanksgiving because I didn’t have time to make the feast. 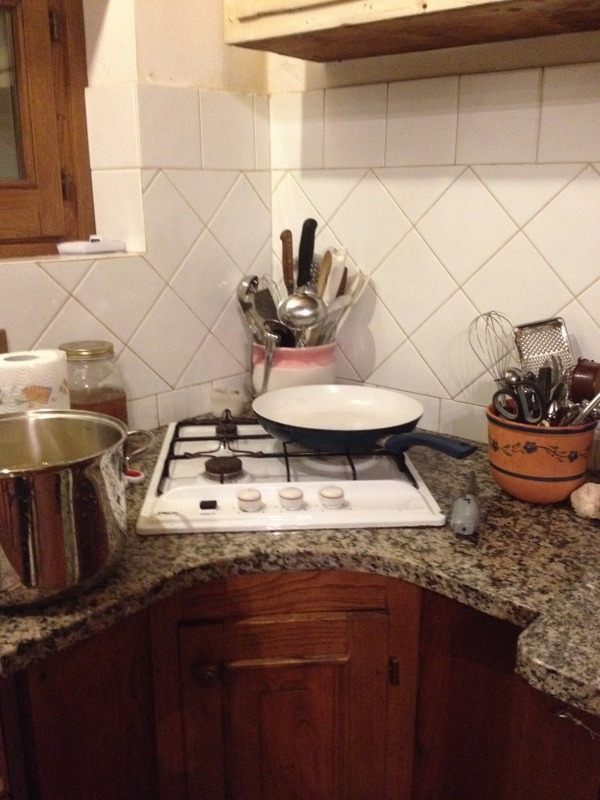 But at least then I was in my own kitchen with familiar ingredients and utensils. This year we thought out everything we needed and gathered and borrowed pots, pans, utensils and what not until we had what we thought we could use. Our menu: Turkey, dressing with an Italian twist, roast butternut squash (couldn’t find sweet potatoes), green beans, mixed berry relish (couldn’t find cranberries), gravy, yeast rolls and pecan pie. FYI for anyone who’s interested – not all yeast in Italy is created equal. I bought what I thought was yeast and it turns out there are many different kinds of yeast here. I bought yeast for bread, not exactly what I needed so the light fluffy yeast rolls were more like dense bread. Oh well – next time I’ll know. We had a wonderful group of friends – Giovanni, his wife Paola, their sons Livio and Stefano, Livio’s wife Anna, Stefano’s girlfriend Lidia, Michelangelo and Rosella. We had dinner in front of a lovely fire. Norman Rockwell would have been proud – it was a cozy setting with good friends and family. The turkey cooking operation-notice the smoke? back down the chimney, so the entire terrace was filled with smoke. By the time Julie and I got there, they were both red-eyed and hoarse from the smoke and more than a little weary about trying to do something that at home was as simple as turning on a switch. This was work, and it was complicated work. 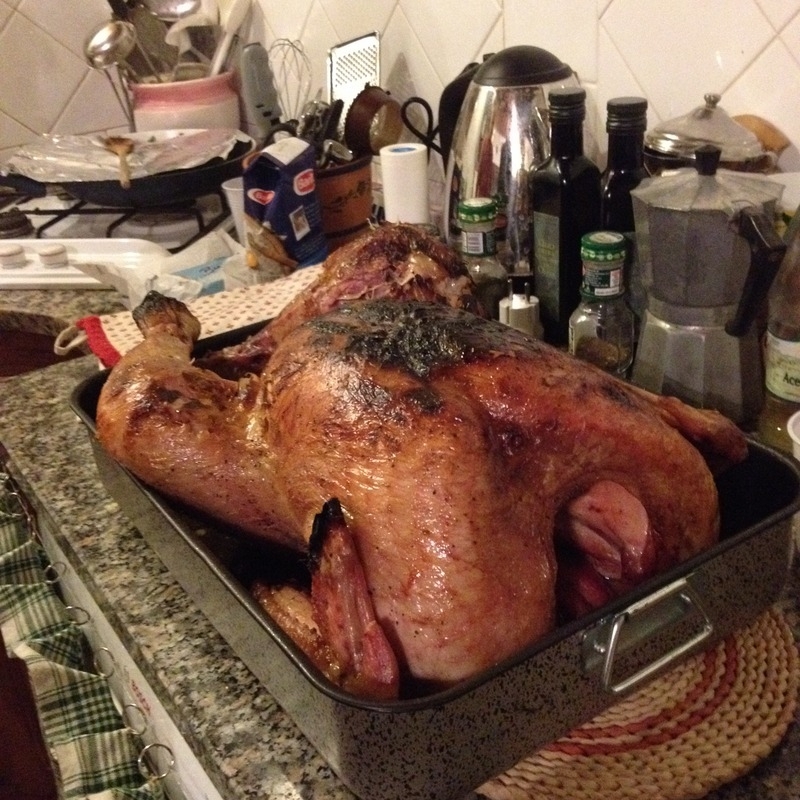 But despite the smoke and the unsure cooking conditions, they produced a turkey that was wonderful. We were all in a different environment working with things that were unfamiliar to us. But in the end, the meal was great, everyone enjoyed the spirit of Thanksgiving and the smoke dissipated. Just like with all Thanksgiving meals, not everything was perfect, but everything was good and appreciated. The turkey – let’s just say it was free range. Thanks to Michelangelo, one of the butchers in town found us a 15 pound turkey. We had to pick it up Wednesday afternoon and dinner wasn’t until Thursday night. Our fridge is nowhere near big enough to hold a 15 pound turkey with everything we had in there. What to do? The butcher was perplexed by our question. This is a fresh turkey, he assured us. It’s cold outside and it will be fine just sitting out. So we took it up to the country house and plopped it on the sink and said goodbye. There’s no heat up there and we were a little afraid we might come back on Thursday to a partially frozen bird, but everything was fine. Easiest bird prep ever. No thawing or trying to stuff it in the fridge. Thanksgiving. It means different things to different people. I’ve known people who don’t celebrate it because of the way the native Americans were treated. I respect that, but I can get past it. I’m not too hung up on the origins of the holiday because I think that, like a lot of things we’ve encountered in Italy, it is legend. Maybe there was a meal that the pilgrims had with the native Americans. Maybe it was a act of peace. Maybe they all did stop and think – hey, this could be worse. Maybe it was just a big old party. Who knows? The thing is, holidays in America tend to all be religious or patriotic in nature. This one is very pure and simple – people thinking about what’s good in their lives. Everyone is welcome at the table and no meal is wrong. Oh, there are the traditional dishes, but really in the end it can be anything to sit down and break bread over. Eating together is a bonding experience. Sharing food and stopping to chat about whatever topic drifts by. This was a Thanksgiving that we’ll all remember forever. Steve and Tim may even still smell like smoke next Thanksgiving. For everything that this country and these people have given us, it was nice to give them something back. To share one of our traditions with them. Thanksgiving Italian style – hard to beat! I was so hoping to have a Thanksgiving blog.The turkey looked like a masterpiece!Loved hearing about your Italian Thanksgiving! It was an experience we’ll never forget. Really missed our family, but it was wonderful being with our Italian “family”.